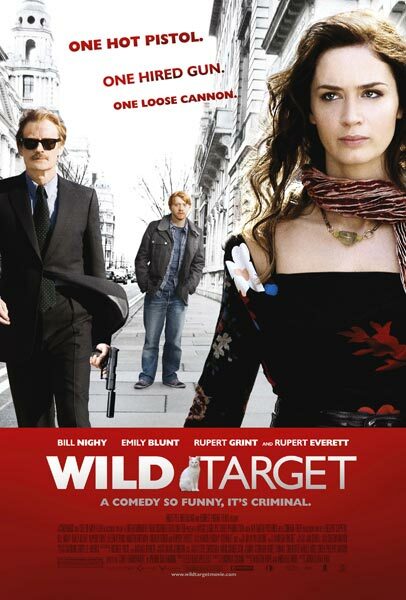 "Wild Target" proves that even a tired story can be fresh as long as it has a sense of style and it is clear from the opening scene that this film does. Bill Nighy is at the top of his game as a hit man who no one is even sure exists he is so good. He walks in and walks out of buildings as if nothing ever happened. He gets the job done, that is why it is strange when his flow is interrupted. Of course, this comes in the form of a young, beautiful woman who just happens to be his target and who happens to be on the run from him and his employer. As his "wild target" Emily Blunt manages just the right balance of quirkiness and likeability. She is a thief and she is clumsy, but she is fun, almost impossible not to like, while we know that if we were actually around her we would probably be quite irritated with her. Added into the mix is Rupert Grint, who rounds out the trio to make a perfect mix of insanity and absurdity. Each of our three leads seem to be having a grand time gallivanting around England trying to stay on the run so as not to get caught while emotions and past experiences create tension and new feelings. It is actually a kind of beautiful mess of a movie. It is a brisk hour and a half of action and wit. The story unfolding with what we expect but the characters making it fun along the way. Rupert Everett pops up in a few scenes and lets his nasty charm show through and the film also offers a glimpse (at least for Americans) at some of Martin Freeman's work. He is best known for playing the Jim" role on the British version of "The Office" (which is kind of funny seeing as Emily Blunt is married to American Jim) but you may also remember him from "Hitchhikers Guide to the Galaxy" and will next see him as a young Bilbo Baggins in "The Hobbit". Here he plays Nighy's rival hit man with a fetish for flashing his veneered smile every chance he gets. It is a small role, but it is a great comic touch and those are what make this movie so enjoyable. The real treats here are the leads though, Blunt as mentioned before commands the film. She makes her male counterparts bow to her free-spirited Rose, causing them to change their normal routine and forcing them to adapt to ways of life they may not have known were she never to fall into their lives. It is especially refreshing to see Grint playing someone other than Ron Weasley, it is easy to see him having the most successful career outside of the "Harry Potter" realm. He is a natural comic talent and being able to play opposite Nighy's straight laced Victor Maynard is just the right kind of role he should be looking for now. It still has traits reminiscent of Ron Weasley, but is certainly in a more mature natured film. The subject and world around him allowing his character to feel more real. And as for my only complaint about the film besides the story line being somewhat generic is the kind of convoluted affections that bring Nighy and Blunt together as a romantic couple. It is hard to buy into at first, not only because of their age, but because they start out really disliking one another. The resolution of the film depends on them getting together though, and no matter how much it may seem awkward we know it is going to happen at some point, it is hinted at the entire film. From the early moment when Maynard's mother asks him if he's gay or not. We know, although we still have hesitations as they grow closer. Something just isn't natural about it. There is no proof besides a tad bit of dialogue as to what made Rose fall for Maynard. We deal though and go on. There is plenty of British humor and enjoyable performances here to look past the one hiccup of the character development. The film is certainly a wild one and for the most part hits its target.